You can stop death by numbers today. Numbers are abstract. The bigger stranger a number is, the harder it is to be digested by your audience. At some point, your audience loses the ability to translate the numbers you spout out into something meaningful. That’s when they check out, lose interest, and give you the blank scary stare. It’s not their fault, and you can do something about it. To keep your audience engaged and focused, you have to translate big and strange numbers into something they can relate to. You have to take the foreign numbers and turn them into something tangible they can wrap their heads around. Turn Gigabits, Exabyte, Metric Tons, Percentages, Megawatts, Trillions, into songs, bicycles, customers, people, buildings, gardens, and anything people can see, touch and smell. After all, your job as a communicator is to turn the intangible into tangible. If I say: the new power plant design will allow us to produce 1000 Gigawatts of energy daily. That may or may not make any sense to you. However, if I tell you that 1000 Gigawatts of energy is enough to power every single city and state in the USA, then, that might be more impressive because now it means something. Notice that translating the 1000 Gigawatts into application and used by states and cities in the US makes the number understandable. As a result, you can now imagine the map of the US and all the cities in it. Instead of trying to make sense out of a meaningless dry number. The trick is to translate abstract, unimaginable numbers into tangible meaningful information. Share your translation into the comment section. If you share in the comment section, I will share with you privately how the late Steve Jobs did this artfully in one of his speeches. Here are 4 examples I heard in one workshop I did (Thanks guys, it was great seeing you in the workshop): you will see the statement of numbers and then the translation. 2- Once you implement this strategy you will get 43% more conversions; that’s 10 new customers per week. 3- I walked 25000 steps last week according to my Fitbit. That’s about 11 miles. 4- Our application analyzes 5 Terabits of data instantaneously. That’s 10 years worth of customer data. Notice that the numbers are less impressive and have no meaning without the translation. If you want to make an impression with your numbers and keep your audience awake, then use this formula every time. 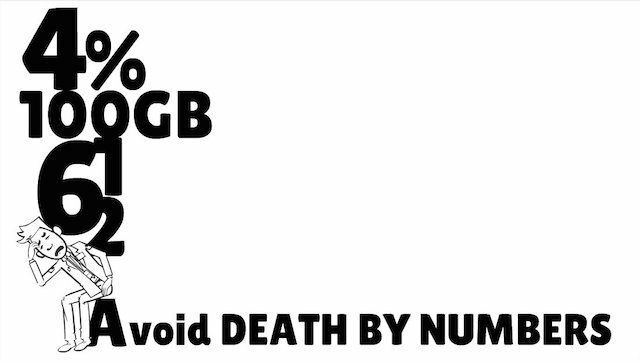 Now you too can stop death by numbers.